If you will recall me saying life is what we have, living is what we do with it. You can have life and not be living, but you can’t be living without life. Having said that, Christmas is about life/living! “…but the angel reassured them. “Don’t be afraid!” he said. “I bring you good news that will bring great joy to all people. 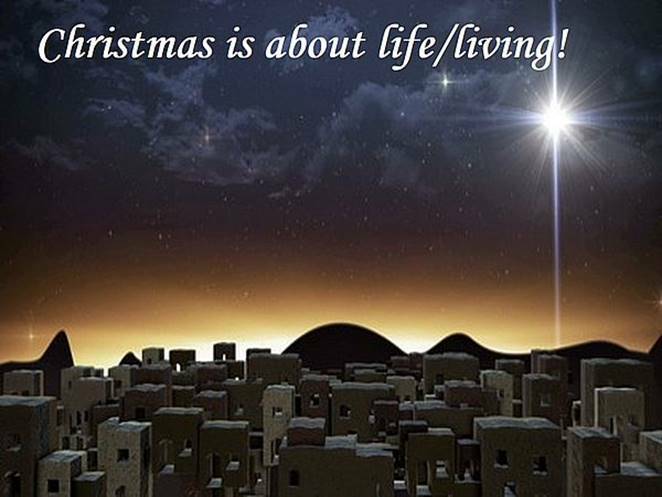 The Savior—yes, the Messiah, the Lord—has been born today in Bethlehem, the city of David!” (Luke 2:10–11, NLT) Now put that together with what Jesus said about himself in chapter 10 of John’s gospel about giving life and giving it abundantly you can see that – Christmas is about life/living! It may be a little difficult for you to see the life/living Christmas Story in the following scripture, but if you’ll be patient maybe it will become clear to you, as it is me. “Unless the Lord had helped me, I would soon have settled in the silence of the grave. I cried out, “I am slipping!” but your unfailing love, O Lord, supported me. When doubts filled my mind, your comfort gave me renewed hope and cheer.” (Psalm 94:17–19, NLT) Because it refers to “…the silence of the grave. I cried out, ‘I am slipping!’” don’t think for a moment that it’s the starting point because it isn’t, the starting point is everything that follows! I am going to risk taking John 10:10 out of context with the ultimate goal of making a point. “…I have come so that they may have life, and have it abundantly.” (John 10:10, LEB) Another way of saying it goes something like this “I was born so that YOU may have life, have it abundantly, and escape the silence of the grave.” On Christmas Day over two thousand years ago God gave us more than His Son, He gave us His Helping Hand. On the day we celebrate that life changing Christmas Day 2017 Jesus may not be born, but the same Helping Hand that was extended that day and every day thereafter is still there!